I found some short pieces of mahogany 2x4 in my collection, many years ago it had come out of a bank that was being refurbished. I’d spotted it in a dumpster on the footpath, managed to get some of the shorter pieces into my car and put it in my pile of “resources to be used for building boats”. That was probably 30 years ago, and I’m down to the last few bits, two of which are now the gunwale blocking for SEI. The task at hand is to build the gunwale structure, that’s the blocking and inwale. To go back a little, when I drew SEI I’d pinched her top plank a little midships to get her narrower there to make it easier to get oars the right length without being ridiculously long, but when I put the boat together I could not get them to lie fair, so I’ve let the top edge spring out and pulled them fair by wrapping the gunwale strip around and glueing it in place. I’ve put fillers in between the frames and the inside surface of the planks where its sprung out and changed the dimensions on the plans to correspond. All that means that I cant screw the blocking in through the planks then cover the screws with the gunwale strip, until the inwale is in place its that outer that’s holding it all fair. I’ll put those screws in later and cover the heads with bungs, but in the meantime I’m cutting the blocking to fit the inside curve and angle required, glueing the blocks in place and rounding all the square edges. Each block has to fit the curve of the side, be shaved on the inside to match that curve, angled on the outside to fit the varying angle of the plank which means a twist in the bevel, and it has to be the same angle from horizontal as all the others. It sounds fussy work, but in reality its not difficult, just a bit slow. All greasy with glue, it takes some fiddling to get the blocks perfectly positioned with the clamps on. The long pieces at the bow and stern are to take chocks ( fairleads in “English” ) for anchor or mooring lines, and the spacing of the blocking is such that all the frame heads are covered with a block slotted over each. I filleted the frames to the planking before I fitted the inwale, its much easier to access without that in the way. The nitrile gloves by the way are "Black Dragon" brand, from Autolink Distributors. They are the best I've found to date, way better than the Ansell ones, but do get them a size up on a perfect fit. Like any of these gloves if they are stretched tight it takes very little to tear them. The blocking on one side is done, the other side will be fitted in the next day or so. For the inwale I’m using the leftover strips from the mast material, they are about 25 x 10mm, and I’ll laminate two in on each side. Dry fitted, just sprung into place to test the fit, from here it came out, had the lower inner corner rounded and sanded, then the glue was mixed up. Just fitted one, rounded the inside lower edge first, sanded the saw marks off, then cut it to length. Glued one end in, clamped it into position, applied the glue to the rest and then sprung it into place. I'm told that its possible to have too many clamps, I can understand the theory but have yet to meet a boatbuilder who has hit that limit. Looks good, I’ll see how it feels before making the decision as to whether or not to fit a second lamination to the inwale. Its my mums 90th birthday tomorrow, and we’re taking her out to a nice restaurant for lunch, so what I do today will have a couple of days for the glue to set up hard. When gunwale on the other side is done the mast box and seat tops can be fitted, not so far to go now. Mind you, its about this stage of the project when the builder starts to see the finish line but forgets that all the really slow, time consuming finishing details are still to be done. About 30 years ago I was lucky enough to walk into a very special shop, all woodworking tools, and it was closing down. The old Yorkshireman who ran it was retiring, and it was all to be sold. Off to the bank, came back with a wad of cash and I told him to keep count and put his hand up when I ran out. One of the things that I bought was a Japanese pull saw, I’d read about them, but had never ever seen one let alone used one, but it was a revelation to someone who’d been using ordinary carpenters saws and a ratty old tenon saw. Fast, smooth cutting, effortless, and accurate, way better than anything I’d ever used before. I bought a handle, and three blades plus sharpening files ( known as “feather files” after their unique shape) and used them for many years. Two touch-ups on the teeth with the file were all I could manage, but even so those saws last a long time and it was only relatively recently that they were so worn that I could not make progress on ordinary wood. There were a number of mail order tool companies who had these but they were all wildly expensive, amazing tools that had been hammered by 99 year old master sawmakers and tempered in the blood of virgins born on the eastern slopes of the sacred mountain as the sun rose above the horizon on the birthday of the emperor (etc. etc. , you get the picture) and my budget did not stretch to that. It was about that time I met Chuck Leinweber and his brand new BoatBuilders supply company. Bingo, one of the first transactions was my purchase of one of his Japanese Pull Saws, I don’t bother fussing around sharpening them any more, the files are hard to find and very costly so I just buy a new blade now and again. Cheap, good, does exactly the same job as the one described above, and I would not be without them. 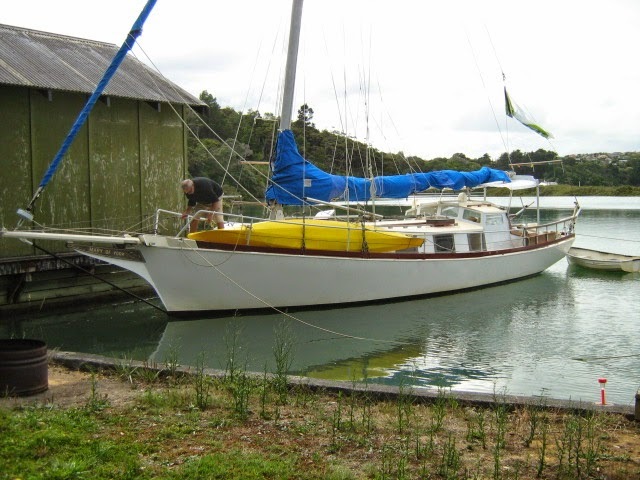 Why I am on about it today, is that I’ve just replaced the blade, I build a boat most years, cut through epoxy and the glue in plywood, hit the occasional nail or screw, cut hardwoods and soft, resinous and salicaceous woods, even plastics on occasion. The blades generally last me for a couple of years even with this kind of abuse. Points? 10/10. 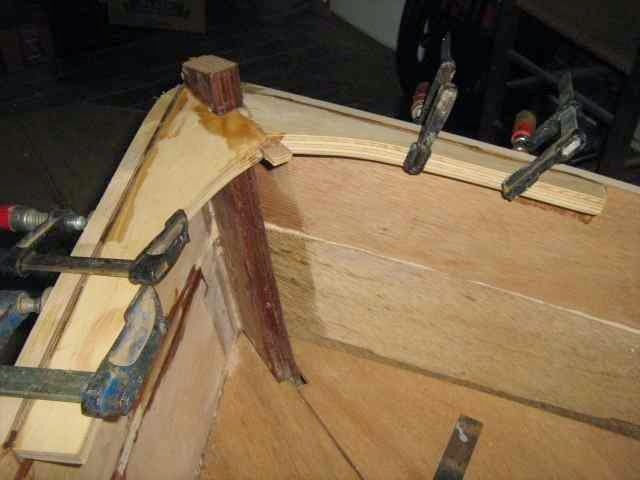 If you are into building boats, and don’t have one, get one, and a spare blade. Rip saw teeth on one side, and cross cut on the other, fine kerf, ( slot) easy to use, very clean smooth cut, and versatile. The storm is still on its way south toward New Zealand but the latest information has it downgraded from Cat 5 to Category 4, that’s still nasty, but it looks as though the cooler waters its encountering as it comes out of the tropics is taking some of the sting out of it. As well, the track its taking is east of our North Island, maybe 100 miles or so off the coast which sounds like a lot, but this storm is several hundred miles across. Still, that distance puts us out of the worst. Right now the rain has hit, its windy, the Marine Nowcasting is saying 45 knots and the forecast is for 55 knots in a few hours, but that’s not really a big deal. There will be some damage, and yes it’s a big deal for those involved but the damage wont be really widespread. I was concerned that the tidal surge would be an issue, but its neaps so the high tide is not as high as it might have been, and although high tide half an hour ago was definitely higher than the almanac said, it was not high enough to do any harm. Its just after 9 am Sunday here, and the forecast says that the worst of the storm is due late this evening. Right now its about 600 miles away and we're getting the first of the wind and cloud. I've secured everything, will be putting a tarp over the cockpit of little Spook up on her trailer in the carpark at the top of the track, I dont want her to be filled up with water by the forecast very heavy rain. The wind is gusty right now, every now and again a big one moves my ship around, ropes groan and she heels against the dock, bumping sharply, making the fenders creak. Its dead low tide now, we're lucky that this is neaps rather than springs so the high will be a metre lower than otherwise, that hopefully will reduce the effects of the storm surge, but looking at my tide gauge I am sure that the water level is higher than it would normally be, I've checked the tide almanac and yes, probably 200mm or so above where it should be. And the storm is still less than halfway between Vanuatu where it has done enormous damage, and us. Scroll down for a live windmap. We here in the north of New Zealand are for the most part just far enough south of the warm tropical seas to miss the worst of the tropical revolving storms that tear through the western Pacific at this time of year, but global warming and the warming of the oceans means that we're not quite so protected as we once were. I really do hope that it slides through the gap between those two countries, there are a lot of people there who dont have a lot in the way of resources and who can be really badly affected by a storm like this. Its heading south, we're not that far away and its predicted to pass us just out to the east late on Sunday, with seriously bad weather along the eastern coast, while I'm a couple of miles up a river that has a narrow mouth protected by a big sandbar, and have a high bush clad escarpment sheltering the river I'm still preparing for the worst. Its high tide about 3 pm, just before things are likely to get serious, and storm surge can mean the water coming well above normal levels. That plus the threat of wave action means I'm doubling up my mooring lines, disconnecting shore power and lifting all the machinery in my boatshed well up off the floor. I was to take a group out fishing tomorrow, sorry guys, hopefully next weekend. Librarian Felice and boatbuilder Ben have just been in here for a couple of days. I’d not met them before, but their niece lives in the house just up the track from my dock and they were wanting to come in and stop in order to have a couple of days doing things like attending a cricket world cup match. 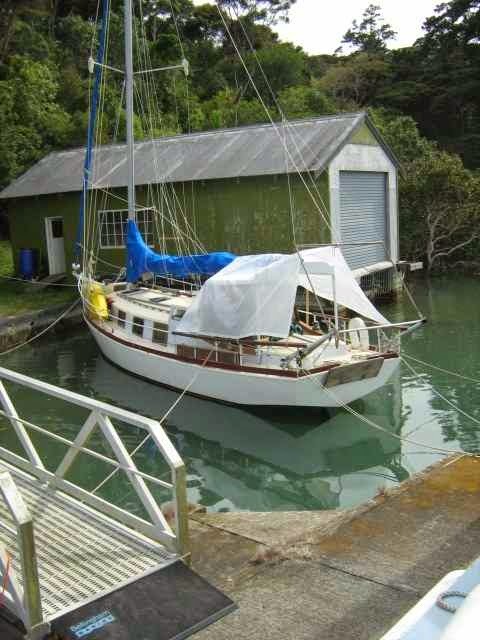 The Mary of York is steel, centerboarder, 38 ft long on deck and a superbly comfortable cruiser. She’s sweet to the eye and well laid out, no Ben did not build her but I suspect that the interior and rig have been the beneficiary of Bens expertise. Being very shallow draft and almost flat bottomed she can sit on the mud, and as the channel alongside my ship is so very narrow we snugged her in alongside the shed. She was bow up somewhat when the water left her, but safe and sheltered. They play Ukulele and Recorder too, I’ve just started to learn same, and we had a lovely little session with me trying valiantly to get the chords right as they played. With boats, sailing, books and music we’ve a lot in common. Its been lovely having them here, and I’ve been invited to visit them at home, yet another reason to go for a drive up to the Bay of Islands where they, and several other friends live. Pakistan downed their South African opponents by the way. Not your average white plastic yacht. Nor your average white plastic people either. I’ve been a bit preoccupied, life gets in the way of the important things such as working on SEI. But yesterday I put the breasthooks in both ends, and today will be making the decision about side decks or blocked inwales on the gunwales. Side decks will keep the water out at a higher angle of heel, blocked gunwales will allow me to tip the water and sand out when I pull her out after a sail, plus are easier to build. The other constraint is what wood have I got, I’ve some strips of 10mm x 24mm left over from ripping the mast staves out of the cheap Baltic Spruce that I’ve used, I can use those and laminate them into place along the blocking which would work well, and that might be the way to go. Otherwise its breaking into a new sheet of plywood and I’m zealously saving my meagre stock for a bigger project later on. Decision made, funny how writing something down makes it more real. 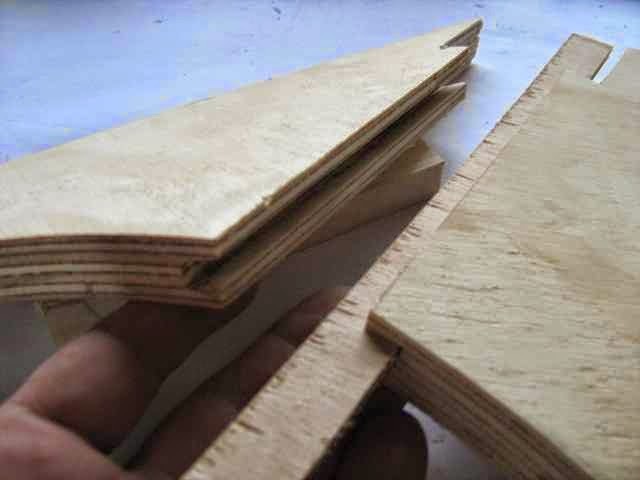 The breasthooks are each made of two pieces of 18mm plywood, joined down the centreline by a glued in 6mm plywood spline. They join at a slight angle and when the glues gone off I’ll round the top surfaces with a sander. The bow one gets a little frame underneath so I can put a cleat on top without risking pulling the breasthook out if the boats bouncing around at anchor or under tow behind the ship. Fitting all the angles is a pain, don’t you love gap filling glues!